Even when a body is submerged in deep and murky water, a specially-trained dog can sniff its whereabouts from the surface. This incredible level of canine capability is being investigated by University of Huddersfield researcher Lorna Irish. Her thesis on cadaver detection dogs will make a powerful case for extending their use in cases of underwater corpses. During her research for a PhD, Lorna has covered several aspects of the work of detection dogs and she has also developed a special fascination for the use of dogs to detect submerged bodies. Globally, there are some 100,000 deaths annual from drowning – including accidents and suicides. Some countries, such as the USA, are ahead of the UK in using dogs to detect the submerged bodies. "When a body is on land it is hoped it will stay in one place, but in water a body can move in three dimensions, so it is a lot more difficult to locate and recover," said Lorna. "It is absolutely fascinating watching the dogs work," she said. "I have seen dogs locate bodies within a metre and they have been quite accurate in depths of about 15 metres of water." 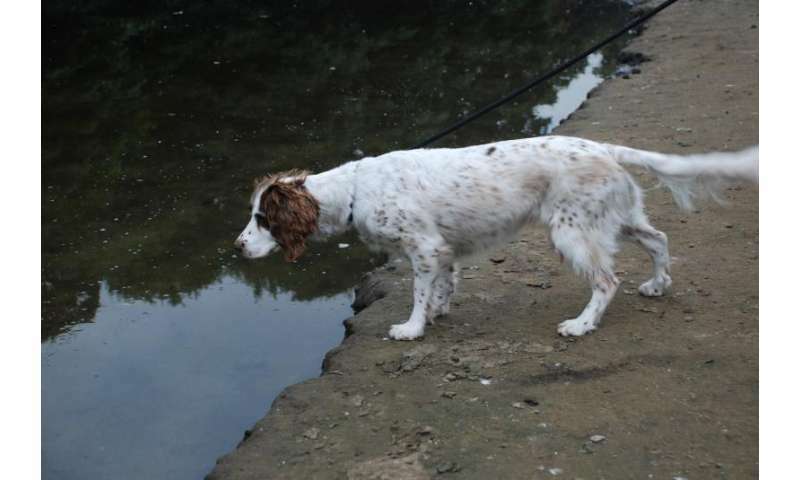 Lorna's research has found that the dogs can only be really effective if they can get down to the level water to clarify the scent or they may not be able to give a clear indication. Therefore, access to the water both from the bank and particularly from a boat is crucial to the success of a search. "If the sides of the boat are too high, the dog will simply not be able to smell the water," says Lorna. There is also evidence that tasting the water is important for the dogs as well. "According to the handlers, many of their dogs taste the water," says Lorna, "and we think that this is a confirmation mechanism used by the dogs to confirm the presence of a body. "Like snakes, dogs have a sensory trigger called the Jacobson's Organ, which can collect chemicals from the air, and also from the water, and the dogs may use this to confirm the indication of a body." Cadaver dogs detecting submerged bodies took Lorna for her research to Ireland, where the practice is well advanced. In the Republic, Lorna witnessed an actual search, for the victim of a fishing accident in Lough Ree. She was on board a boat while a dog, sniffing the waters from the deck, detected the presence of a body and she witnessed training exercises in which a human cadaver was simulated by a dead pig, submerged in a body bag. "Using dogs to detect a submerged body is not foolproof, but it is a valuable extra tool," says Lorna. However, it is a practice that is not widely used in the UK. Largely this is down to the lack of dogs and to lack of money. Training a cadaver dog can be expensive "and then there are other costs like funding a boat or the dog may have to be 'bought in' from another police force or organisation," added Lorna.